I really enjoy watching knitting podcasts while I knit, and I have gotten some questions as to who I´m following. I find new podcast each week, and here is my current “one to watch” list in no particular order, maybe there are some that are new to you that you can check out? I think that was all. I try my best to keep up, but sometimes life gets in the way. But now that summer break is upon me, I will be able to catch up and I´m looking forward to that! Sometimes I feel like I´m living under a rock, so if you have any suggestions to new to me podcast that I ought to check out, please do tell! I got some wonderful surprises in my message box on Ravelry this month! Pattern gifts from several Ravelry friends! My birthday was on April 6th and since then I have had little surprises waiting for me every week! These patterns are my knitting inspiration and what I use to motivate myself to finish some of my UFOs… I´ve decided that I have too many projects tucked away, and I need to deal with some of them before I cast on something new. I can´t wait to cast on the following projects, but not until some of my UFOs are finished objects! But there´s no harm in showing you my inspiration and talk about some yarn choices, is it? 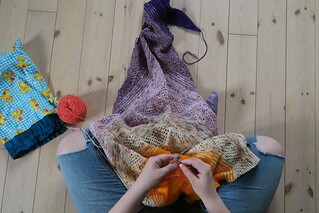 I love the look of this shawl! I have several yarns in the stash that I think will look nice in this pattern. I find it hard to find something to use my lace yarns for, but this might be the pattern! I´ve got some Rowan Fine Lace in a nice mustardy yellow, some TuLLiBaLL Strå in a blueish color and I also have a midnight blue skein of Eden Cottage Yarns Theseus Lace. Ah… decisions! I saw this shawl on JuniperGraceTube and I immediately fell in love. I probably don´t have the right weight in my stash, so I have no idea what I want to knit this in. I have knitted a pattern from this designer before, Camilla babe, which I loved! So I just know that this will be a fun knit! This hat has been in my queue for some time and I completely forgot about it, but when I saw it on the Knittingdish podcast, I had to move it up on my to-knit list! Such a beautiful hat. No idea what yarn this will be knitted in, but it will be knitted for sure! I found this cowlette when I was looking for patterns that could work with handspun yarn. I like the combination of cowl and shawl, because I find that small shawlettes often fall off my neck if I don´t pay attention. But with a cowlette that won´t be any problem. And I think this pattern looks so simple and sweet! These socks will most likely look lovely in any kind of solid or semi solid color, and I´m pondering about using the Opal Hagebutte which is NOT a calm yarn. But I think it could be fun to try. Thank you so much to everyone for these lovely birthday gifts! They are all so lovely! And you are all so so sweet! Tip: It took me some time to figure out how you can make a wish list on Ravelry. If you add a pattern to your queue you can tick the box that says “Include this Ravelry Download PDF on my wish list”, and you will add the pattern to a seperate wish list, as well as your queue. I love this feature, because I tend to put way to much things in my queue in the spur of the moment, and find, at a later time, that I for some reason didn´t feel that this was a pattern I would like to knit. If you make a wish list, anyone who feels like doing a random act of kindness, be it your birthday or just any day knows what you want!